They’re not master thieves – they’re ex-paratroopers. And they’re going to rob five Las Vegas casinos. Koo-koo, baby! Frank Sinatra is Danny Ocean in OCEAN’S 11, a breezy heist flick that is too cool for its own Camel filtered cigarette, too slick for its own Brylcreemed pompadour, too koo-koo kutchoo for its own swingin’ hep cats. 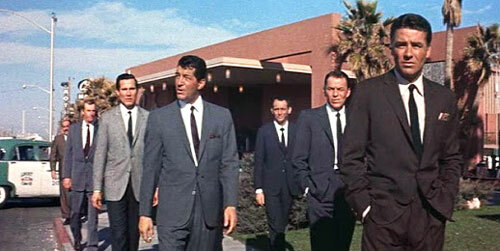 Together with other unofficial members of The Rat Pack (Henry Silva, Normal Fell, Richard Conte, Buddy Lester, et al), Ocean’s plan is to heist the five casinos along the Las Vegas strip on New Year’s Eve, planning it like a military operation. Akim Tamiroff is discomfited overlord Spyros, the gang’s funder. Towering Cesar Romero is Duke Santos, a “connected” guy who dates Lawford’s mum. His interference in the aftermath of the heist would be the trigger that causes Danny Ocean to make one fatal mistake in his plan. Rat Pack “mascots” Angie Dickinson and Shirley Maclaine fill out the female color. Dickinson’s role as Danny’s ex, is that of an independent strong woman, but in the end comes off as nothing more than a throwaway plaything of a powerful man (especially with that waist the size of a wrist); Maclaine’s cameo is purely juvenile fun. The most interesting parts of OCEAN’S 11 are “getting the band back together” – the ex-soldiers being recruited from civilian life. It would culminate in that iconic shot of the Eleven around a pool table, swearing an oath to the heist. (This sequence was another of the many instances Frank would overrule his director on a film – here, veteran Lewis Milestone (ALL QUIET ON THE WESTERN FRONT) gets the Frank treatment, when Frank insists they got it on one take and refused to do another.) The actual heist is a low-tech affair, so is dated beyond snoring belief, with lots of sneaking around in plain sight, crossing wires in fuse boxes and spraying door knobs with ultraviolet paint. The excitement is almost bearable. Unlike the many copycat films that would follow OCEANS 11, including the 2001 remake with Clooney and Pitt, Vegas looks so easy to rob that a few guys who jump outa planes could do it. Just create a blackout from the one telegraph line that feeds the city, then “cross the wires” on the emergency lighting so that when it’s meant to flip on, it will instead unlock the vault doors. Oh, and make sure the vaults are guarded by rickety old guys with no guns. Koo-koo baby! This was back in the day when all of Vegas’s cash was stored in basic, off-the-rack wall-safes. And the Vegas police department was one doughy guy and five grunting apes. 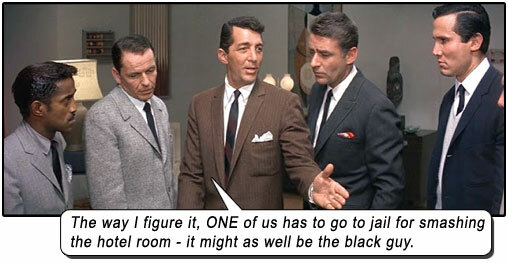 Four white guys on Ocean’s team boost the cash and stow it in the garbage cans of each hotel (again, back in the day when major casinos’ garbage was just housed in steel trash cans from Sylvester the cat cartoons), awaiting the black guy disguised as a garbage man to gather all the money bags in a garbage truck, take them to the dump, then go rooting through the garbage to pick them out. Not racist at all. 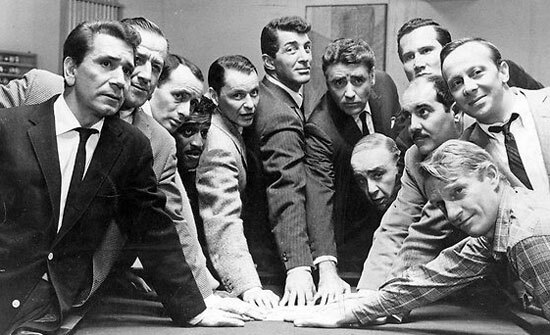 The last plot twist is hilariously bittersweet – a sucker punch to the smarmy faces and glib hepness of our anti-heroes – and the final shot is the movie’s most blasé of its many self-aware gags, as the Rat Pack dejectedly file past a casino marquee heralding Frank Sinatra, Dean Martin, Sammy Davis Jr., Peter Lawford and Joey Bishop. Writers: Harry Brown, Charles Lederer, George Clayton Johnson, Jack Golden Russell, Billy Wilder. Starring: Frank Sinatra, Dean Martin, Sammy Davis Jr., Peter Lawford, Angie Dickinson, Richard Conte, Cesar Romero, Joey Bishop, Akim Tamiroff, Henry Silva, Buddy Lester, Norman Fell, Red Skelton, George Raft, Shirley Maclaine.